I’m so excited to be doing my second YAA! Chat (Review:YA = Young Adult, A = Adult, ! = Excitement, Chat = Interviews, getting behind-the-scenes with other writers) and GIVEAWAY! 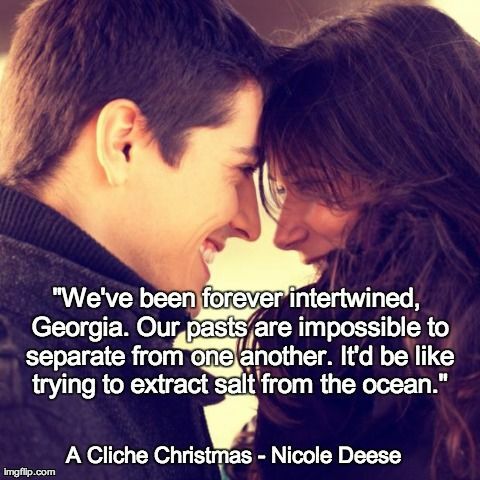 Today, I have the absolute pleasure of introducing Nicole Deese and A Cliché Christmas! ⇐ This is Nic ole. Author. Texan. Tim’s Wife. Preston & Lincoln’s Mom. When she isn’t writing, she can be found fantasizing about “reading escapes,” which look a lot like kid-free, laundry-free, and cooking-free vacations. **Warning: finishing this book will give you an insane desire to listen to Christmas music while you bake cookies…then you’ll want to curl up in a fleece blanket and re-watch all of your favorite Holiday movies…and you won’t be able to wipe the smile off your face! √ A happy, death-free ending with kisses and hope! Even though I could guess what came next, it in no way lessened my delight-filled squeals as I un-wrapped every scene. A Cliché Christmas was extremely well-written, amusing and filled with enough banter and SPARK to decorate (and light) said needless-tree. I HIGHLY recommend this book! So much fun–and wonderful, realistic romance *sigh*. I can’t wait to read it again! JK: You told me this is your first novel in this genre. What are your other novels about, and what drew you to this genre now? 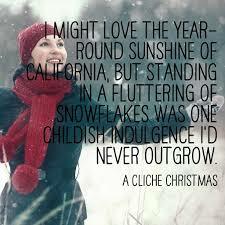 ND: Well, I write Contemporary Romance, but A Cliché Christmas is more of a Romantic Comedy. It was very refreshing to write something on the lighter side—even though Georgia did have to wade through some emotional turmoil to find the fun in being back home again. JK: Do you have a special time to write or how is your day structured? ND: Since my boys (ages 9 and 6) are in school six hours a day, I’m “supposed to” be writing during that time. But unfortunately my brain comes to life around 11 p.m. So that makes the early mornings a bit of a struggle. JK: Any tips on how to get through the dreaded writer’s block? ND: Read. Read. Read. I’ve experienced a dry spell in writing several times, and the best cure I’ve found is to pick up a book from an author I love…and READ. Inspiration often follows after a good book. JK: Did you do anything weird/random while researching this book? JK: Which actor/actress would you like to see playing the lead character in A Cliché Christmas? ND: I’d have to say Jennifer Lawrence. Because, well, I just love her. JK: Which character in A Cliché Christmas is the most like you? ND: Georgia. I relate to her a lot actually–her humor and sarcasm are very similar to my everyday world and my daydreaming started at a very young age. JK: What are you working on at the minute? What’s it about? ND: I’m working on a series about estranged identical twin sisters—can’t say much about it yet. But yes, there IS romance. Have no fear about that. Wrapping paper or gift bags? Gift bags for sure! I’m all about the simple. When do you put up and take down your Christmas tree? Usually after Thanksgiving—except when we travel home to Oregon for Christmas. Then I just kick back and enjoy my parents’ tree and decorations. What do you put on top of your tree? Um . . . a star I purchased from Dollar Tree a few years back. Suffice it to say, Mama needs to buy a new one. Favorite gift received as a child? A life size Barbie Doll. For real, the girl was as tall as me and her hair was longer than mine. And straight. 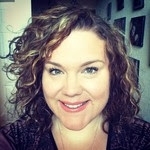 (An anomaly for this curly-headed girl.) I loved her! Best gift you’ve ever given? One year my family had the opportunity to help a teenage girl who was about twenty dollars away from becoming homeless. We bought her clothes, food, and had her over for our family’s Christmas Day festivities. It was an amazing experience. And I’ll never forget it. Favorite Christmas movie? Christmas Vacation and Elf are always big favorites around here–but my own personal Christmas Eve tradition is to wrap gifts (or drop them in gift bags) while watching Pride and Prejudice (Keira Knightly version). I LOVE LOVE LOVE that movie! What do you love most about Christmas? The togetherness–family coming home, friends stopping by. I love to share life with people, and the holidays are usually a perfect time to do just that. What’s your favorite cliché? Kissing in the snow. Always. **Her debut novel, an Inspirational Contemporary Romance, All for Anna, has hit multiple milestones since its release in January 2013, including a 4.7 star rating on Amazon and more than 120,000 downloads on Kindle. 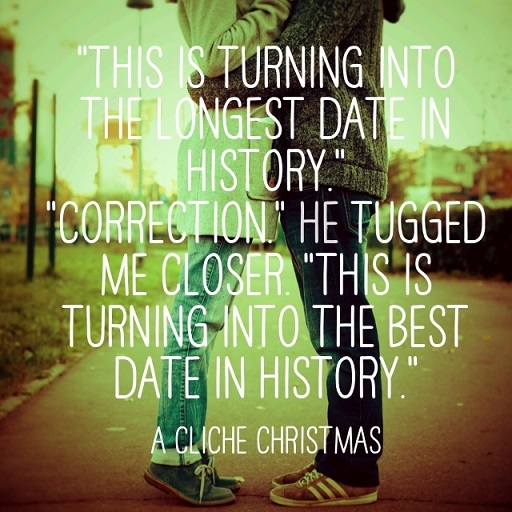 She has since completed the Letting Go series and is over-the-moon excited about her new release, A Cliché Christmas, published by Waterfall Press, an Amazon Publishing imprint. 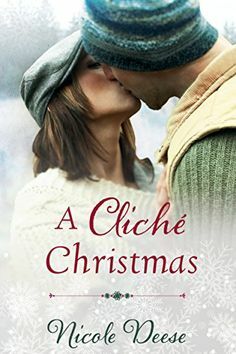 A Cliché Christmas is available at Walmart stores nationwide and on Amazon.com. Good luck! THANK YOU for joining me and Nicole! Posted on November 22, 2014 by Janelle Leonard	• Bookmark the permalink. My favorite Christmas memory was a few years ago. We lived in another town then we do now. There was a family that lived up the hill from us and didn’t have much money. I secretly went to their door and left some toys on the porch for the little boy for Christmas. I know he wouldn’t have had any if I hadn’t left them. I was so pleased to secretly look out my window and see the delight on his face and the happiness from the mother when they were discovered. Janelle – You ask the “funnest” questions. (I know, it’s not a word, but I love it anyway.) Nicole’s romance sounds like the perfect read for the holidays. I want it! Thanks for sharing her success as an author too. Wow, WalMart stores? That’s a dream. I’d love to see my books at WalMart stores! My favorite cliche? I’ve never thought about that. Maybe, “There’ no place like home?” I’ve been gone for 10 days ghost writing a memoir and just got home last night and finally slept in my own bed so that phrase is fresh in my mind. I wish Nicole all the best and will look for her books!